As an exciting warm up to our 2019 Teacher of the Week season, we invite you to participate in our first ever FSIoffice Ultimate Teacher Wish List Contest! We are giving out a total of SEVEN $250 TEACHER GRANTS to spend on school supplies from FSIoffice! For a chance to win, tell us what FSIoffice products are on your Ultimate Teacher Wish List, and explain why you need these items and how you plan to use them in your classroom if you are selected as a winner - the more details, the better! The contest opens on March 27, 2019, and it closes on April 30, 2019. Only teachers from schools in North Carolina, South Carolina, and Virginia are eligible to win. * 3. Tell us what FSIoffice products are on your Ultimate Teacher Wish List. Explain why you need these items and how you would use them in your classroom if you won a $250 grant for school supplies - the more details, the better! * 4. What grade and/or subject do you teach? * 5. 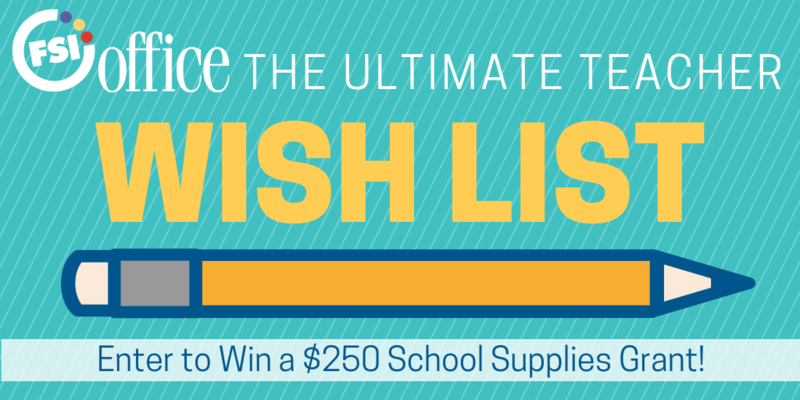 How did you hear about our Teacher Wish List Grant? Social Media- Facebook, Twitter, Instagram, Blog, LinkedIn etc.